American pioneer aviatrix. The first woman to fly solo across the Atlantic. Newsprint portrait photograph with autograph signature of Amelia Earhart below the image. 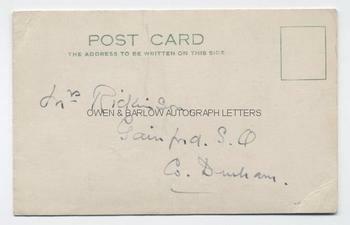 The newsprint photograph is mounted on a postcard and has been signed on the card mount.The post-card is addressed on the verso to "Mrs Rickinson, Gainford S.Q., Co. Durham". It measures approx 5.5 x 3.5 inches. Slight crease to lower right corner, else fine. 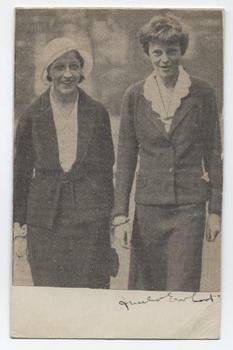 We think that this photograph was taken on the occasion of Amelia Earhart's first Atlantic flight (with Stultz and Gordon in 1928) and that the other lady in the photograph is possibly Mrs Foster Welch, the Mayor of Southampton. Amelia Earhart set many aviation records but is best remembered for her solo crossing of the Atlantic Ocean in her Lockheed Vega monoplane on 20th May, 1932. Four years earlier, she had become the first woman to fly accross the Atlantic when she made the crossing with Wilmer Stultz and Louis Gordon. Amelia Earhart disappeared over the Pacific whilst attempting a circumnavigational flight round the globe in 1937. She was never found and the mystery of her disappearance has never been solved. Her early death and the fascination around her life, achievements and disappearance have ensured that her uncommon autograph has always been in demand.